Natural Planet™ Duck & WhiteFish Entree Grain Free combines duck and tasty whitefish with wholesome fruits to deliver a healthy and delicious, easy to digest meal your dog will love. Natural Planet™ features organic and non-GMO ingredients to offer your dog a healthy, natural diet (with added vitamins and minerals). And because it is made by Natural Planet™ you can be sure that it is formulated and produced with care using the finest quality ingredients from our family to yours. -Balanced Omega 3 & 6 Fatty Acids - Supports a healthy immune system, a shiny coat & soft supple skin. -Organic Non-GMO Ingredients - Features Organic & non-GMO Ingredients to maintain a complete balanced nutrition for your dog. -Prebiotics & Probiotics - Supports intestinal health and well-being for your dog. Duck, whitefish, salmon meal, chickpeas, organic peas, chickpea flour, organic pea flour, tapioca starch, sunflower oil (preserved with mixed tocopherols and citric acid), pea starch, duck meal, natural fish flavor, dried kelp meal, salmon oil, calcium carbonate, potassium chloride, dried brewers yeast, organic flax seeds, salt, apples, blueberries, minerals (zinc proteinate, iron proteinate, copper proteinate, manganese proteinate, cobalt proteinate, selenium yeast), choline chloride, vitamins (vitamin A acetate, vitamin D3 supplement, vitamin E supplement, niacin, d-calcium pantothenate, thiamine mononitrate, pyridoxine hydrochloride, riboflavin supplement, folic acid, biotin, vitamin B12 supplement), lactic acid, carrots, celery, beet, parsley, lettuce, watercress, spinach, L-ascorbyl-2-polyphosphate (source of vitamin C), yucca schidigera extract, calcium iodate, rosemary extract, yeast culture (Saccharomyces cerevisiae), dried Lactobacillus acidophilus fermentation product, dried Enterococcus faecium fermentation product, dried Aspergillus niger fermentation extract, dried Trichoderma longibrachiatum fermentation extract, dried Bacillus subtilis fermentation extract. 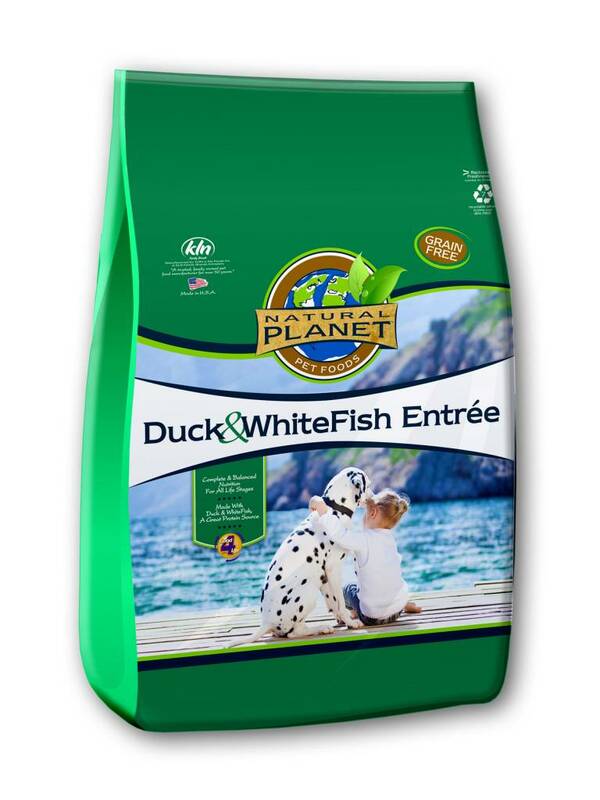 Natural Planet™ Duck & Whitefish Entree Grain Free Dog Food is formulated to meet the nutritional levels established by the Association of American Feed Control Officials (AAFCO) Dog Food Nutrient Profiles for all life stages.